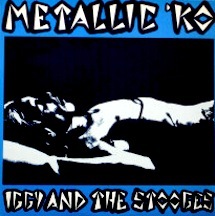 The other day I was listening to an old record album by Iggy and the Stooges. It was a live concert from about 1973. I have been a fan of the Stooges for 35 years or more. I like to dig up one of my old records, crank up the volume and listen. I still clearly remember the first time I played this album, Metallic KO. It’s intensity was impressive. I taped the album and played that cassette over and over. The opening song on Side 1 of the album is Raw Power. It is Iggy and the Stooges live in October 1973. Listen to it, if you can…. Play it loud. The mind-numbing & mindless rhythmic thumping one minute in to the song still makes my skin crawl after all these years. The entire band is in sync and they are just hammering the living daylights out of their instruments. Dance to the beat of the living dead. I bought the album from a record import store known as “White Light Records” based in Sydney. You could not buy the album from conventional record retailers. My mother and sister went to Sydney one day and I asked if they could pick up the album for me. When my mother asked for the album on my behalf the guy behind the counter at White Light Records was reluctant to give it to my mother and sister. He thought that they might be from a religious organisation investigating albums with bad language or sinister lyrics. My mum asked him to give me a call and I said it was okay. You gotta laugh. Iggy and the Stooges had a cult following here in Australia. Fans of Iggy were also usually into bands like the Velvet Underground, MC5 and Radio Birdman. None of my friends or relatives owned albums by Iggy. I eventually met a fellow student at the University of Wollongong who also had some albums by Iggy and the Stooges. I was not alone after all. I had the fortune to see Iggy perform live about four times. As I listened to the album I thought I would browse YouTube for some of the recent reunion performances of Iggy and the Stooges. The original guitarist from that show in 1973, James Williamson, had recently retired from his job as Vice President of Technology Standards for Sony and joined Iggy for some reunion shows. The band came to Australia and played at some festivals around the country early in 2011. I was curious to see how the recent shows compared with this performance from 1973. Off to the web I went. I found some clips from that tour on YouTube and Raw Power was played with as much intensity by the band as it had been back in 1973. I was mesmerised by these video clips recorded by fans wielding iPhones and other mobile devices in the air. iPhones. Not cassette recorders as I once did. Iggy’s getting old but he still has some grunt left in him yet. Remember, Iggy is 63 years of age at the time of these performances. I hope I have that much energy at age 63. Seeing a new generation of young fans getting off on music delivered with such energy by a band of really old rockers pleased me no end. Listening to the old vinyl album and browsing through those YouTube clips of Iggy and The Stooges live in 2011 was uplifting. In a sense, a revelation. I had seen it all before but seeing and hearing this new generation getting right into music that I had so thoroughly enjoyed all those years ago was sort of reassuring. In another sense it was also a vindication that my choice of music to listen to back in the 1970s was okay. I am not alone. I also felt a sense of pride in that I had been enjoying that same music for 35 years or more. Yes. One generation to the next. No break. No pause. Continuous. It was like one generation passing the baton to the next. Generation X, Y, baby-boomers. In a way those labels all seem rather meaningless. Do we really need them? One generation is no different to the next. We are all from the same generation. Now. Raw Power live at the Big Day Out, Perth, Australia. 2011. Crap sound but you get the idea. Iggy and the Stooges live at the Big Day Out, Melbourne, Australia. 2011. Iggy mixes it up with the crowd.